Prototype: TEE 75 "Roland". 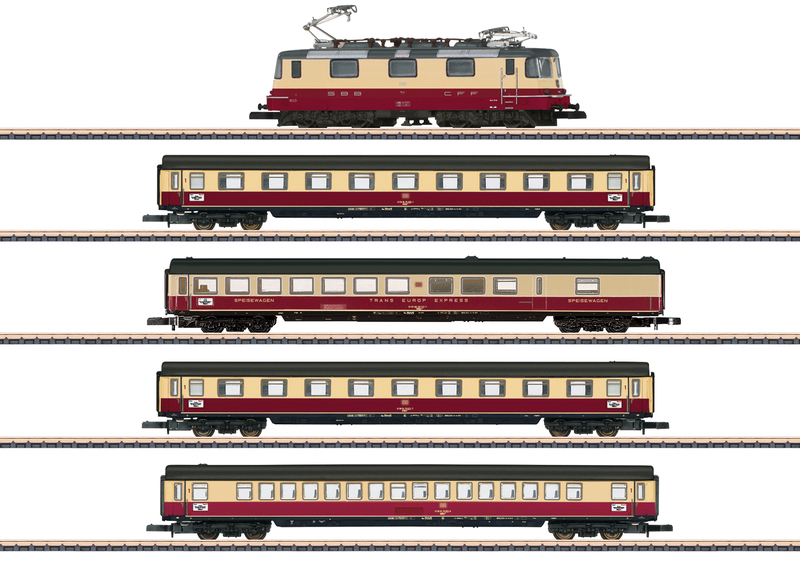 Consisting of a class Re 4/4 II with round lower headlights, 2 type Avümz 111 compartment cars, 1 type WRüm 132 dining car, and 1 type Apüemz 121 open seating car, all in the TEE paint scheme. The train looks as it did in Era IV around 1971. Locomotive includes round lower headlights. LED lighting with Swiss headlight / marker light code. Model: The locomotive has round lower headlights for the first time and a motor with a bell-shaped armature. All axles powered. Maintenance-free warm white LEDs (3 each white in the front, 1 each white lower right rear (Swiss headlight / marker light code). The rail clearance devices on both trucks are movable. Current pickup can be switched from catenary to track. All four (4) cars are imprinted in the "TEE design". Train length over the buffers approximately 565 mm / 22-1/4". P Triple headlights and a white marker light that change over with the direction of travel.